This engaging coursebook aims to teach critical thinking skills – the ability to interpret, analyse and evaluate ideas and arguments. 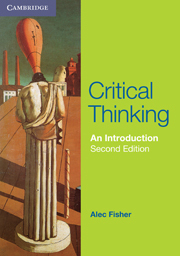 Alec Fisher’s approach is based on a widely shared conception of critical thinking and covers many of the basic skills and competencies displayed by good critical thinkers. It is suitable for a wide range of students in schools, colleges and universities and may also be used for self-study.